A UBC graduate student who was allegedly attacked by her husband in Bangladesh in June is learning to live without eyesight. Rumana Monzur had gone home to visit family when she was brutally assaulted. Her husband, Hasan Sayeed Sumon, is accused of choking her, biting off her nose and blinding her in front of their five-year-old daughter. In her first interview since returning to Canada for medical treatment, Monzur told reporters on Tuesday she remembers the attack — and seeing her attacker's fingers gouging out her eyes. "I thought that's the end of my life. I could hear my daughter screaming from beside me. I felt that's the end of me," she said. Monzur's nose has been reconstructed through surgery but she is still blind despite four surgeries. Aside from her physical rehabilitation, Monzur said the hardest part of the ordeal is living with the anguish of what happened to her. "I still can't believe the father of my child can do this to me ... you can't accept it." However, she's determined to move forward for her daughter. "I want my daughter to see a confident mom, not a mom that's totally devastated," she said. Monzur said her daughter was frightened to learn her mom had been blinded, but being a role model for her daughter has helped fuel her recovery. "It's not in my nature to sit there idle and do nothing and mourn about what has happened to me," she said. "That's not like me. I can't be like that. I need to accept my limitations, but I will try my best. I will." Monzur said her strength comes from those who are helping her recover. 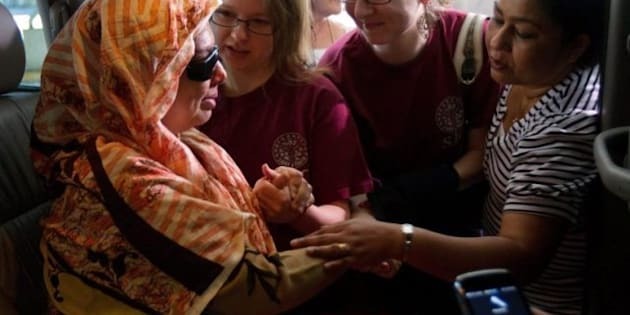 "My eye doctor told me when my vision could not be restored, he said: 'You know, Rumana, they won't let you drive a car or a bus — but other than that you can do anything,'" Monzur said. "That is the one sentence that gave me enormous amount of hope when I thought I have lost everything." Monzur is learning Braille and specialized computer skills for the blind, and attends therapy in an attempt to put the attack behind her. "Sometimes I feel like a newborn who's learning every day something new," she said. "I'm living just one day at a time now. I'm going to be happy again. I know I have to be happy because of [my daughter]." Monzur admits she is frightened when she thinks about what she has lost, but is determined not to let her attacker win by allowing fear to run her life. "It's not fair that for someone else's actions you suffer like this and go through these challenges and difficulties," she said. "It doesn't seem fair but I don't want to be a loser. I still want to be fulfil my dreams, not only for myself but for my daughter."